On the morning of October 19, 2018 astronomers at the Catalina Sky Survey in Arizona detected and named asteroid 2018 UA. A short time later, traveling at 50,760 Km/hour 2018 UA passed at a distance of 7,300 – 15,350 kilometers. For perspective, television satellites orbit at more than 35,000 kilometers. 2018 UA became the 4th closest asteroid approach in recorded history. Earth was never in danger, at 3-6 meters in diameter 2018 UA would disintegrate on contact with our atmosphere. At worst a meteoric fireball visible in the light of day might herald 2018 UA’s fiery demise. As it was, 90 minutes separated 2018 UA from initial discovery to near earth cosmic footnote. 90 minutes is worth pondering. Asteroids are sneaky, cosmic debris ricochets at will. 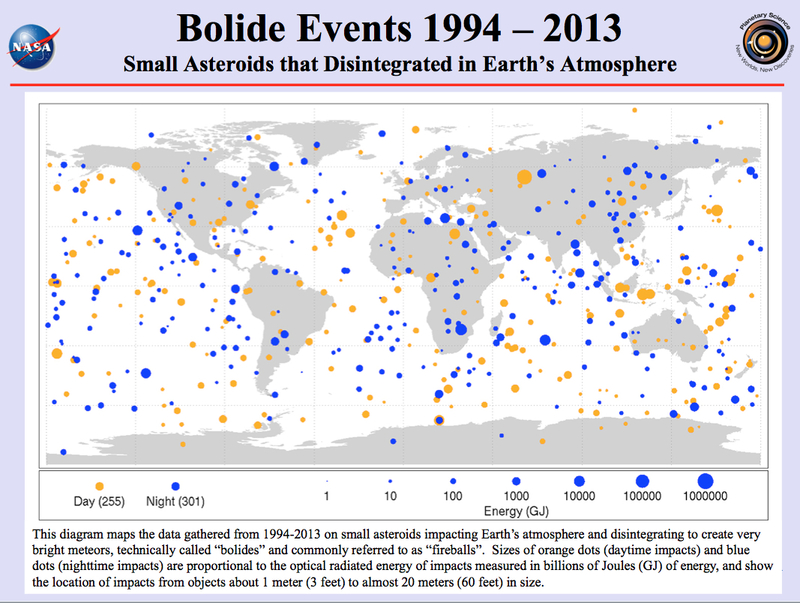 Without prediction, apology or reason, asteroids can appear with very little warning. The first and most important step in assessing the impact risk of an asteroid or comet is to determine whether any given object’s orbit will cross Earth’s orbit — and then how close it will actually get to our planet. JPL was determining high-precision orbits for a few NEOs even before NASA launched its NEO Observations Program, and has since upgraded its orbit models to provide the most accurate assessment available for asteroid positions and orbits. Observatories around the world take digital images of the sky to detect moving points of light (the asteroid or comet) over days, weeks, months (and even decades! ), and then report the positions of these moving objects relative to the static background of stars to the Minor Planet Center. See “How a Speck of Light Becomes an Asteroid”.The CNEOS scientists then use all this observation data to more precisely calculate an NEO’s orbit and predict its motion forward in time for many years, looking for close approaches and potential impacts to the Earth, its Moon, and other planets. A CNEOS system called “Sentry” searches ahead for all potential future Earth impact possibilities over the next hundred years — for every known NEO. Sentry’s impact monitoring runs continually using the latest CNEOS generated orbit models, and the results are stored online.In most cases so far, the probabilities of any potential impacts are extremely small, and in other cases, the objects themselves are so small — less than 20 meters in size, or nearly 66 feet — that they would almost certainly disintegrate even if they did enter Earth’s atmosphere. “In most cases, the new measurements mean the object can be removed from the risk list because the uncertainties in the orbital path are reduced and the possibility of impact is ruled out,” Chesley said. More recently, CNEOS also developed a system called Scout to provide more immediate and automatic trajectory analyses for the most recently discovered objects, even before independent observatories confirm their discovery. Operating around the clock, the Scout system not only notifies observers of the highest priority objects to observe at any given time, it also immediately alerts the Planetary Defense Coordination Office of any possible imminent impacts within the next few hours or days.A recent example is the Scout-predicted impact of the small asteroid 2018 LA over Botswana, Africa. In the span of 90 minutes 2018 UA went from discovery to fourth closest asteroid approach in recorded history. October 6, 2013 scientists at Catalina Sky Survey noticed an anomaly approaching Earth on the night side of our planet. For three days asteroid 2013 TX68 basked in feverish observation. Barely time to estimate diameter of 38 meters, woefully short of establishing accurate orbital projections. Three days after raising eyebrows, tracking ground to a halt when 2013 TX68 passed into Earth’s daytime sky. Post 1,002 finds me pondering a near Earth asteroid. Not one of the 1,634 potentially hazardous objects currently identified and monitored by science – my thoughts are with 2015 VY105. Less than a day after discovery on November 14, VY105 passed over the Pacific Ocean at a distance of 34,000 Km. Trust me – that’s close. Undetected until a few hours before passing, closer than many Earth orbiting satellites, traveling at an estimated speed of 62,000 km/h, we were never in danger. At 3 – 9 meters, VY105 wasn’t big enough to cause trouble. Even if it spanked our atmosphere, an asteroid that size would disintegrate before impact. Witnesses to a hypothetical demise, might have been rewarded with an outstanding fireball. In October 2008, asteroid 2008 TC3 pulled a similar stunt. 19 hours after detection TC3 entered our atmosphere over the Sudan. Estimated at 4 meters, it vaporized long before hints of calamity. Small doesn’t necessarily mean harmless – in February 2013, a fireball and explosion over Chelyabinsk in Russia’s Ural mountains, blew out windows, injuring over 1,000 people. Undetected, this meteor wasn’t named, no impact crater was found. Science believes damage from an estimated 15 meter asteroid occurred when it exploded 15-20 Km above ground. Entering the atmosphere at a shallow 20 degree angle, it blazed across the horizon at over 62,000 km/h disintegrating at low altitude with the force of 300 kilotons TNT. The asteroid that exploded near Chelyabinsk, Russia on Feb. 15, 2013 has provided scientists new insights into the risks of smaller asteroid impacts. This 3D simulation of the Chelyabinsk meteor explosion by Mark Boslough was rendered by Brad Carvey using the CTH code on Sandia National Laboratories’ Red Sky supercomputer. Andrea Carvey composited the wireframe tail. Photo by Olga Kruglova. Credit – Sandia National Laboratories. Rather than criticizing astronomers over a few missed space rocks – plant seeds of collective determination to properly fund science. Cosmic science encompasses far more than raising a flag on Mars. Every satellite, probe, telescope and innovation takes us closer to solving the dilemma of rogue asteroids. VY105 managed to buzz Earth hours after making itself known – we have to do better than that. 2004 BL86 Has a Moon! Get out your binoculars – the evening of January 26/27 arrives with asteroid 2004 BL86. A measly 3 LD (three times the distance from Earth to the Moon), and walloping 650-950 meters across – 2004 BL86 will safely pass, no cause for alarm, and barely noticed. Not to be seen again for 200 years – at the very least gaze skyward, and thank the cosmos for another near miss. Tomorrow the annual Geminid meteor shower peaks. Every December Earth crosses paths with asteroid 3200 Phaethon – more accurately, asteroid junk left behind when Phaeton orbits extremely close to the sun. Extreme solar heat causes expansion and “cracking”, a process responsible for trails of asteroid debris. 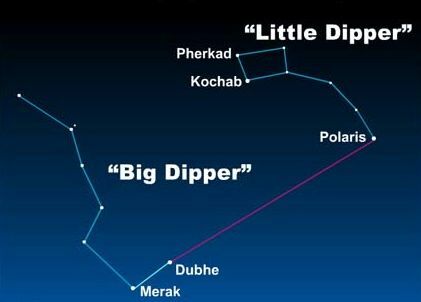 3200 Phaethon may be a paltry 5 Km. across, yet delivers a respectable average of 120 meteors an hour. Technically visible anywhere on the planet, Geminids are considered a Northern Hemisphere show.Named for their radiant point, constellation Gemini – the higher Gemini rises, the more fireballs we see. Northern latitudes lay eyes on a early rising, high soaring Gemini, southern latitudes can still say hello – they just have to wait a little longer (or earlier if you consider pre-dawn morning). 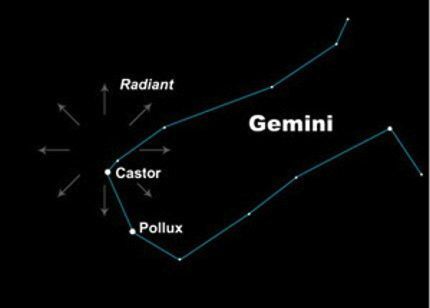 Gaze toward the eastern horizon – Gemini reaches its highest point around 2 AM. Get away from city lights, settle in, give yourself 20 minutes oor so until your eyes adjust, and above all – happy Geminids.